Ever notice how your muscles and joints start to squawk as the temperature begins to drop in Autumn? It’s usually worse after periods of immobility such as getting out of bed in the morning. Many of us tend towards inertia when the temperature drops, sitting for longer periods and choosing to drive rather than walk. Although much research has been done on whether the weather has a direct effect on our muscles and joints, the results are mostly inconclusive, as pain is subjective. However, it does appear that pain is one of our body’s natural responses when adapting to changes in the environment. Both temperature and humidity can affect the homeostasis of our muscles and joints. Our muscles expand in more humid climates and in dryer, cooler conditions, they contract. The contracting and lengthening of our muscles can cause pain. As a result, our joints can become stiff and affect our flexibility. Mostly, it all comes down to circulation. When we are warmed up, our blood circulation provides better nutrition to our muscles, tendons, ligaments and joints. We are better able to stretch and move with ease. Staying mobile is the key to reducing stiffness and pain in muscles and joints. If you have problem areas such as your shoulders, neck or knees, gently moving these areas from time to time, especially after sitting for extended periods, helps to reduce the discomfort. Regardless of age, movement is important to our health. It improves our metabolism, increases our blood flow, which carries nutrition to our muscles and other tissues, aids our immune system and helps with our mood. It’s important to keep up with physical activity in winter and not risk losing muscle mass and strength, as well as bone density. 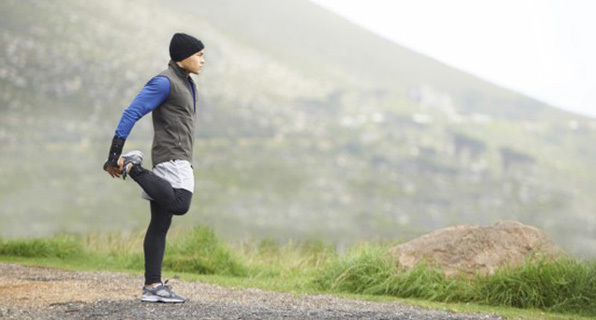 Avoid letting your muscles become tense in the cold and dress in layers when heading outdoors. As your body warms from activity, peel off the layers. A hot shower or bath is another good way to warm muscles and improve circulation throughout the body. Stretching is best done after these warm-ups. Breathing deeply throughout your stretches brings oxygen to your muscles, relaxes and helps with the elimination of lactic acid, reducing pain. This month our “warm up” specials will keep your muscles conditioned, your joints mobile and your mood serene. Let us keep you in shape for the great outdoors!